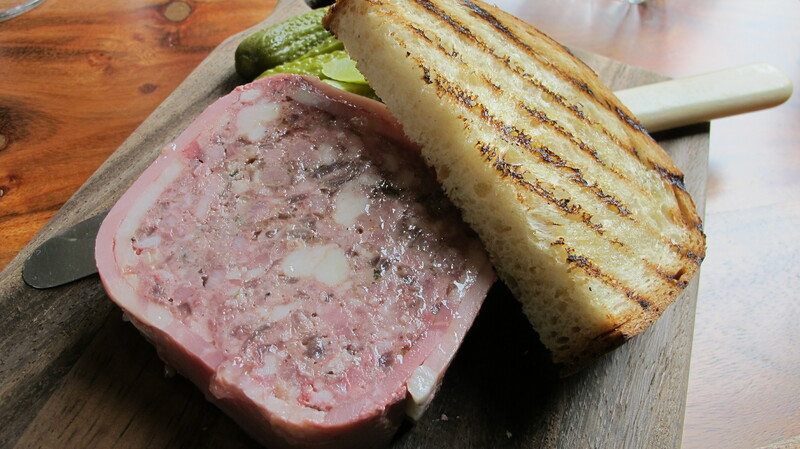 Terrines, brawn, pate, rillettes I adore them all! I think Matthew Kemp does too. 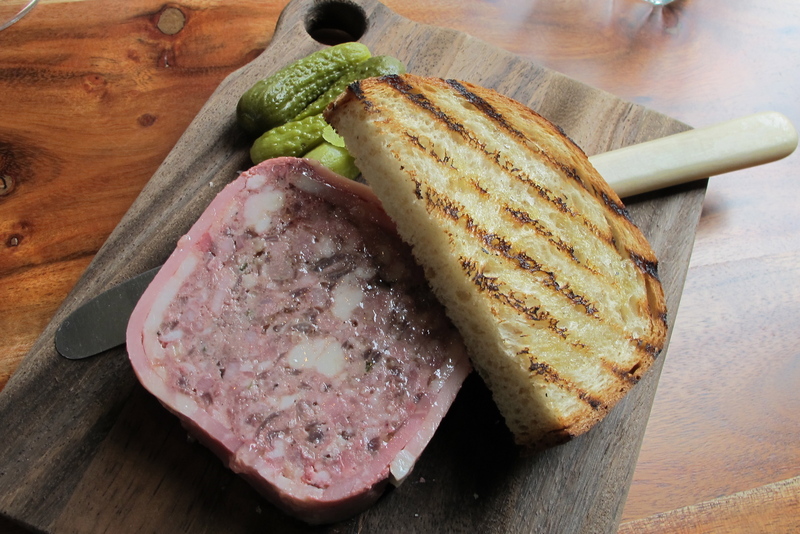 He is the man behind the transformation of the fine dining establishment, Balzac, into The Montpellier Public House. Unfortunately I didn’t make it to Balzac before it closed, but I’d always heard great thing about the place. I’ve been eyeing off The Montpellier for months and months. It was finally time to go! They have a restaurant upstairs but I was happy to stay in the more relaxed downstairs area for lunch. The set lunch menu is ever changing and today’s offerings sounded like it would hit the spot. Pressed pork wrapped in more ham, fat and all, is excactly the sort of food I like to eat. I was so inspired by the country terrine that I went home and dragged out some books to try and make my own. That hasn’t happened yet but I have not forgotten. I’m just working out which one to make first. The staff are attentive and great at advising those of us whose eyes are usually bigger than their stomachs. 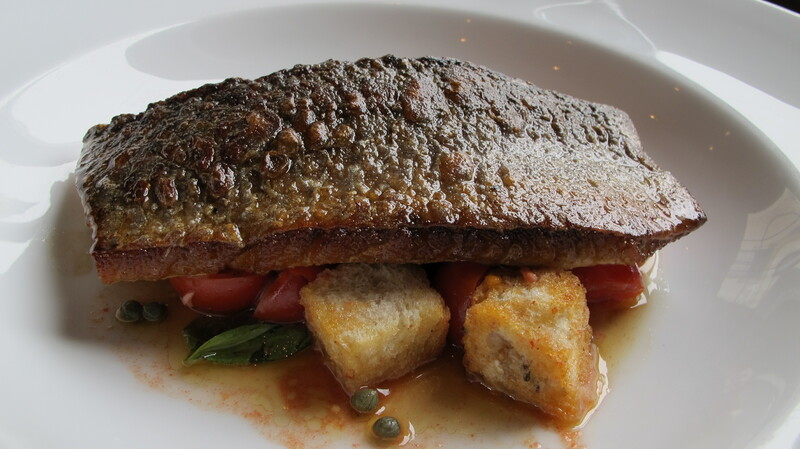 Heeding that I chose the pan fried sea mullet for main, instead of the roast I was thinking sounded good. 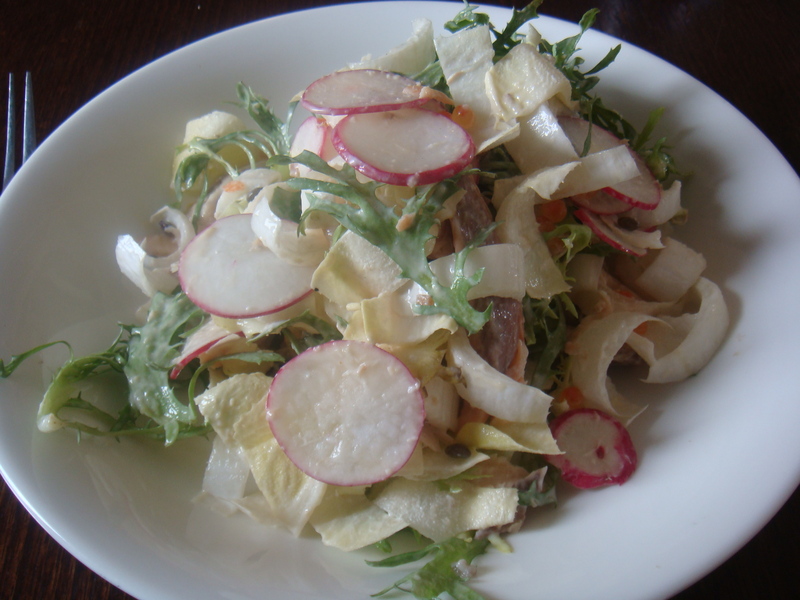 Skin was crispy, salad was balanced, bread had soaked up all the flavours, ticked all the boxes. 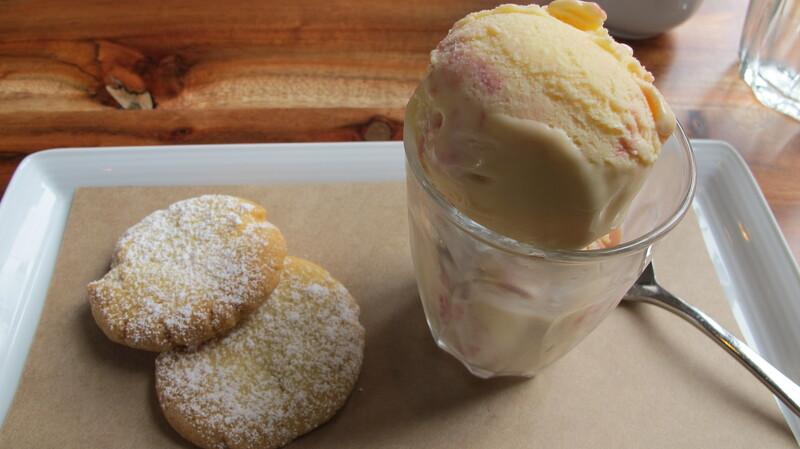 A simple dessert of raspberry ripple and elderflower ice cream served with shortbread. I’m not a great lover of heavy deserts and this was perfect for me. The ice cream was so rich and creamy, thank goodness I didn’t have access to the rest of the stash. 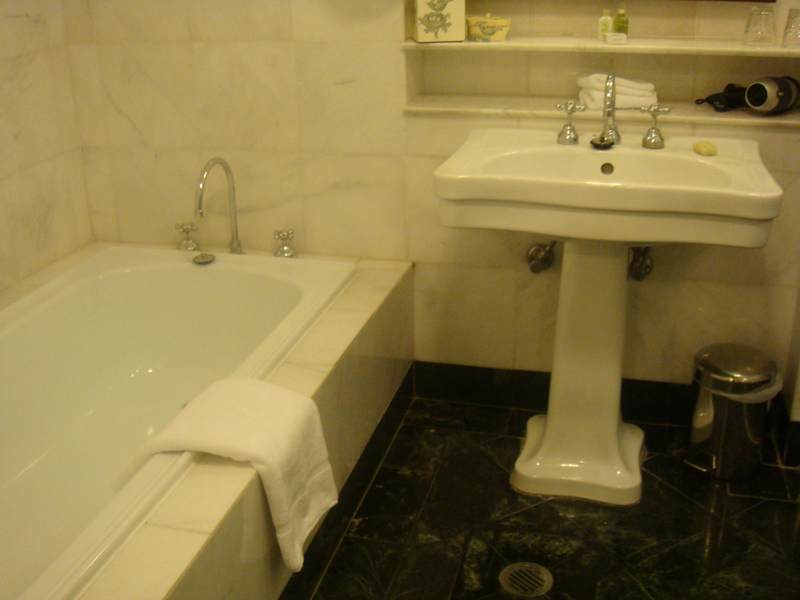 The Montpellier is one of those places you can easily see yourself returning to again and again. Randwick folk, consider yourselves very lucky to have this place on your doorstep. I’m still finding my feet in Sydney. Still finding my friends, still getting lost and still finding out about the latest restaurant to cause a fuss. 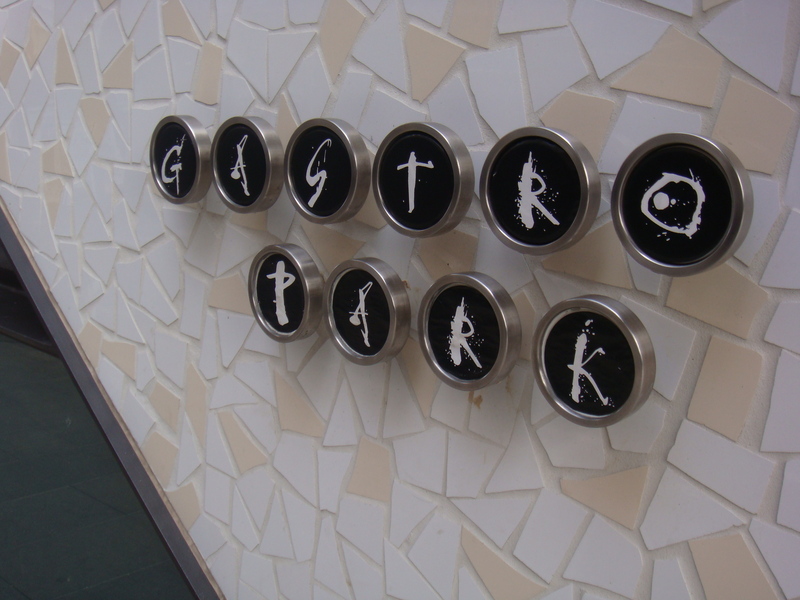 Gastro Park came up in a recent conversation and, luckily, was shortly followed by an invite, with a group of new friends. Gastro Park is one of the new places which seems to be appearing in every lifestyle magazine and newspaper as Grant King’s (ex Pier) new place. Miss P, Sugarpuffi, Creamymiddles, IDreaminChocolate and I were booked for a late Saturday lunch. I arrived to find a fairly quiet restaurant. Maybe it was the combination of the location, being Saturday and late lunch time but I thought it would have been packed. Good for us anyway. The service was friendly. The interior of the restaurant is very simple. The tables and chairs are likened to a nice cafe althought the artwork is certainly not. The modern bold coloured painting is on loan from the Tim Olsen Gallery. Unfortunately they have to return it soon or pay the $10,000 price tag. It really does sit well on the concrete wall though, shame. Gastro Park have a snacks menu. I guess you can describe them as being between an amuse bouche and an entree in size. On arrival the snacks did not fail to have us wide eyed. 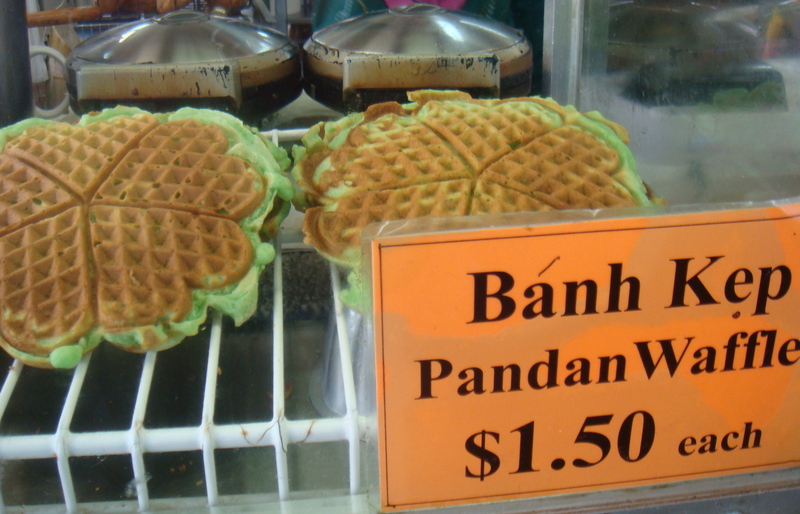 Could you ever imagine the Putanesca Wafer ($6) would come out like this??? 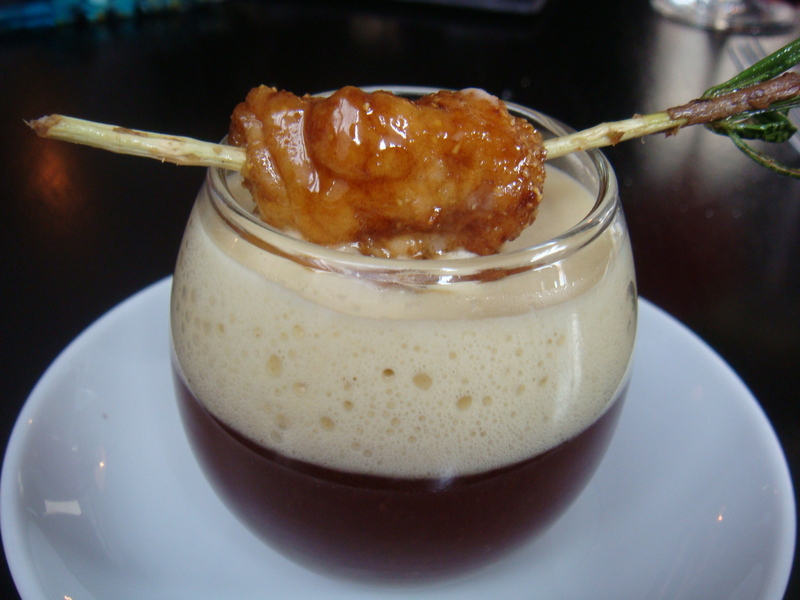 The onion and mushroom macchiato with caramelised veal sweetbread ($9). I LOVE sweetbreads and the sweet caramelisation always brings enhancement to the little glands. The onion froth was full of flavour and the mushroom broth worked well with it. 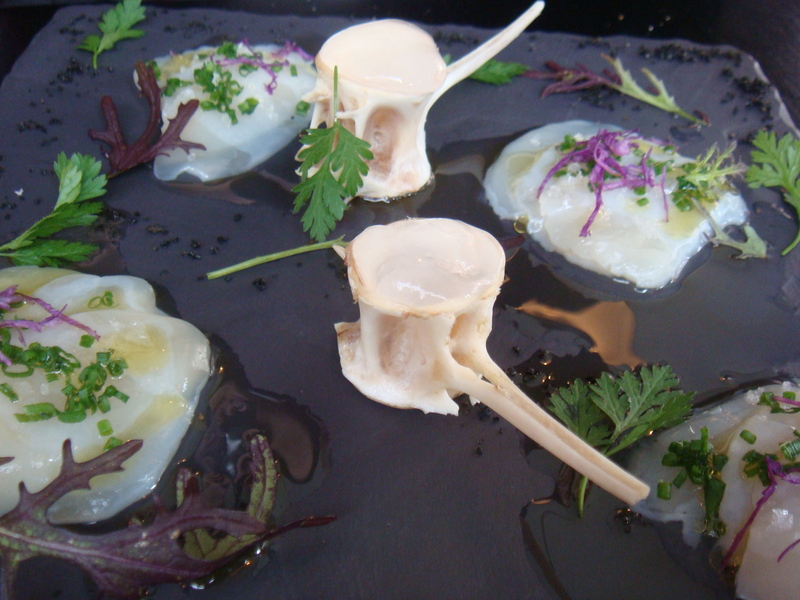 What a beautiful plate, Raw scallop, tune bone, marrow, lime, sea salt, olive oil and chives ($16). I was torn between this and the sweetbreads but I love them too much to pass them over. 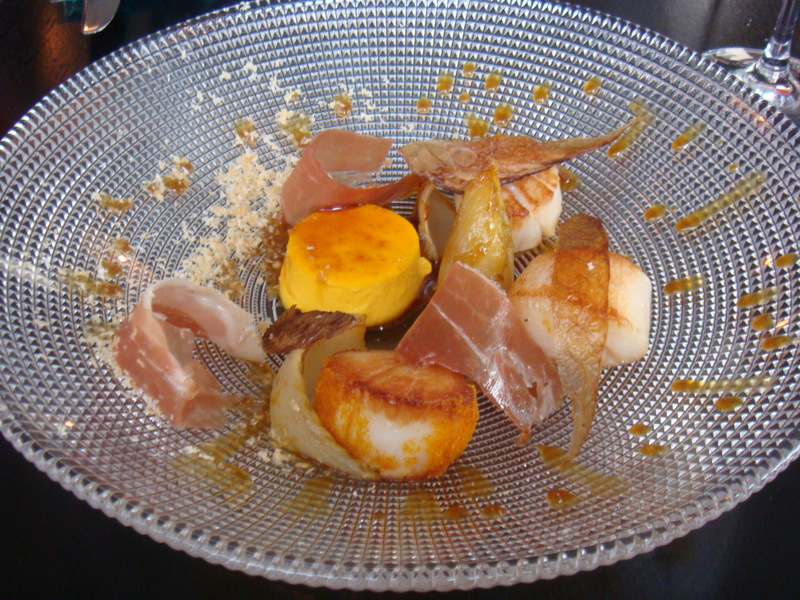 I chose the seared scallops, serrano ham, creme carrot, endive caramel and marcona almonds($26) next. It was enjoyable and the flavours worked but was there some serious, ‘not quite right’ crunch to the outside of one of my scallops. Alot of thought has gone into plates that complement the dish. That plate is gorgeous, isn’t it. The word on the street is the snapper($39) is amazing everyone. So of course I had to see what the fuss was about. 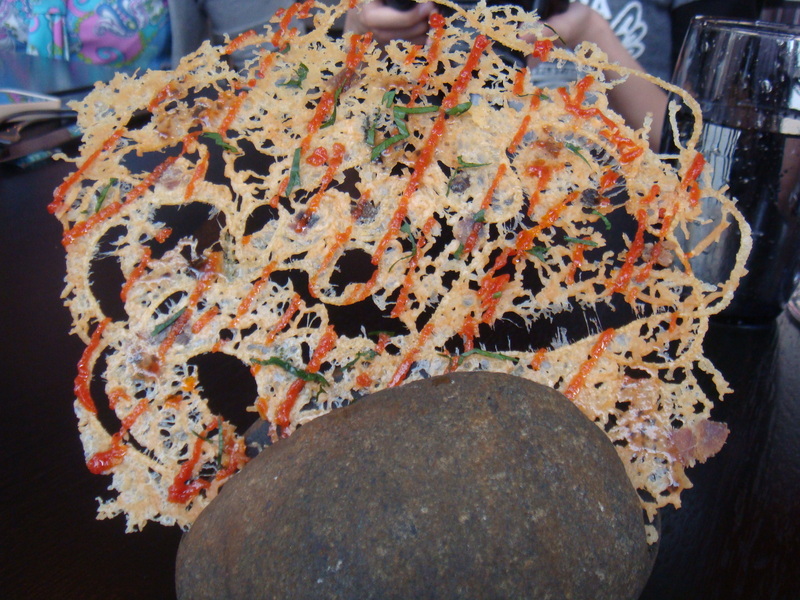 The calamari crackling was curiously good, I was just so intrigued how they did that? The scales are left on the snapper and hot oil is poured over them to crisp them up and make them palatable. It was an interesting texture at first and I liked the thought of the scales being edible but the novelty wore off especially after finding a few that had missed the hot oil. 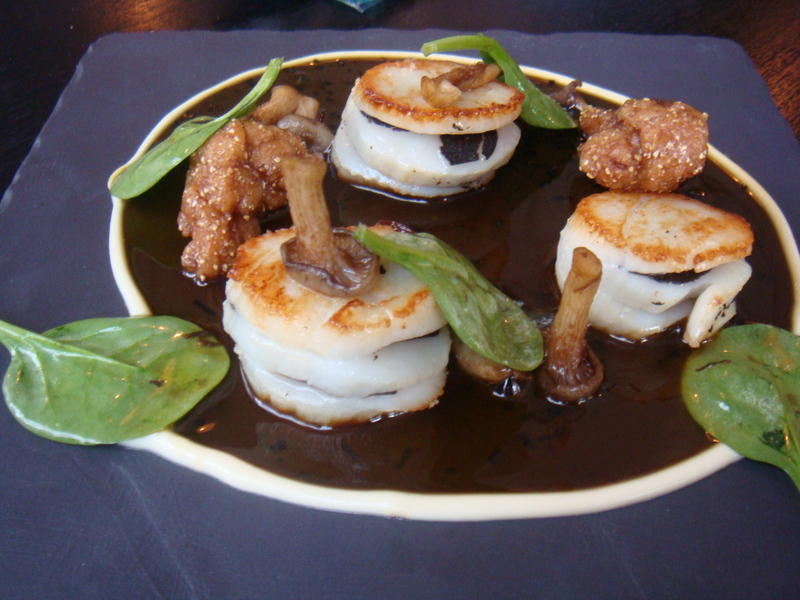 The truffle dish of the day was seared scallops, sweetbreads and a mushroom and truffle jus. 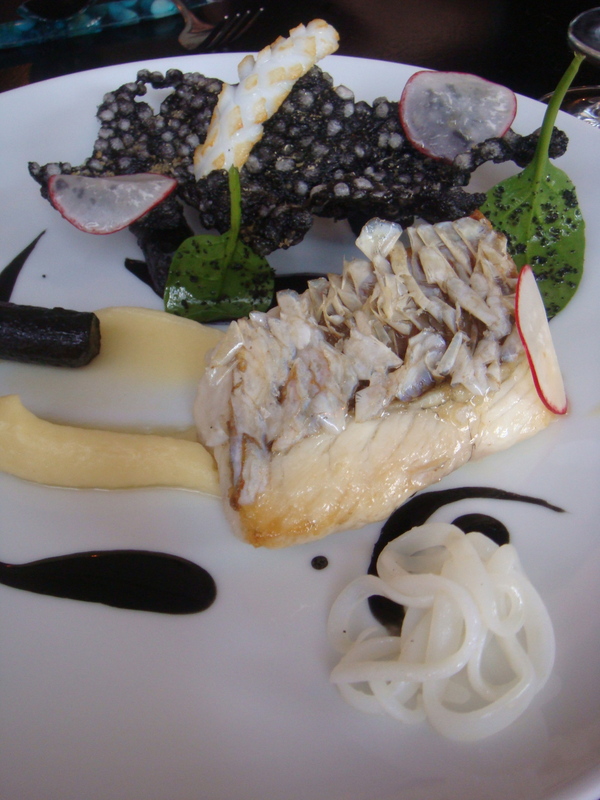 Even though the scallop was layered with truffles the flavour was quite delicate. I think thats why the original price of $55 kept reducing until we got the final bill of $39. Not enough truffles left at the end of service. Not to worry, I’ve been spoilt with truffles before, was good of them to adjust the price accordingly. The difficult choice of choosing dessert was quickly made once I saw the word rhubarb. I just love the stuff. 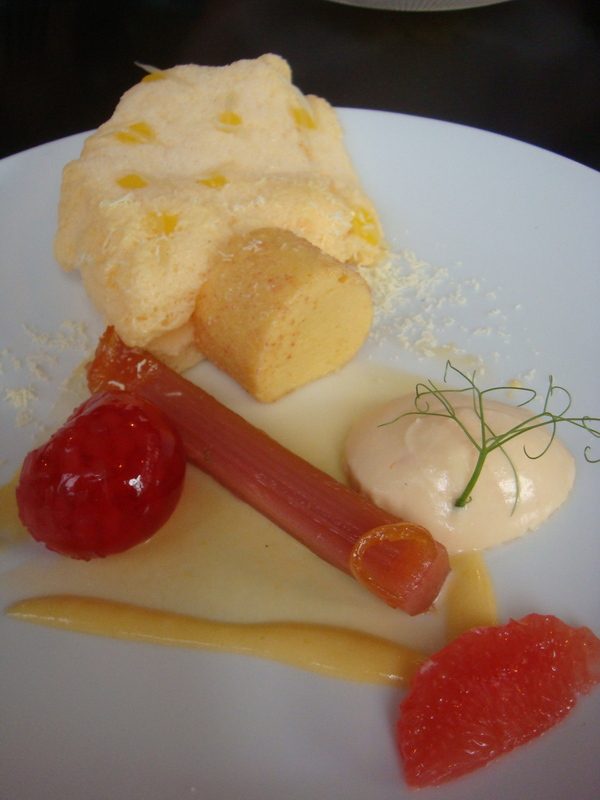 It was an interesting array of rhubarb and citrus textures($20). 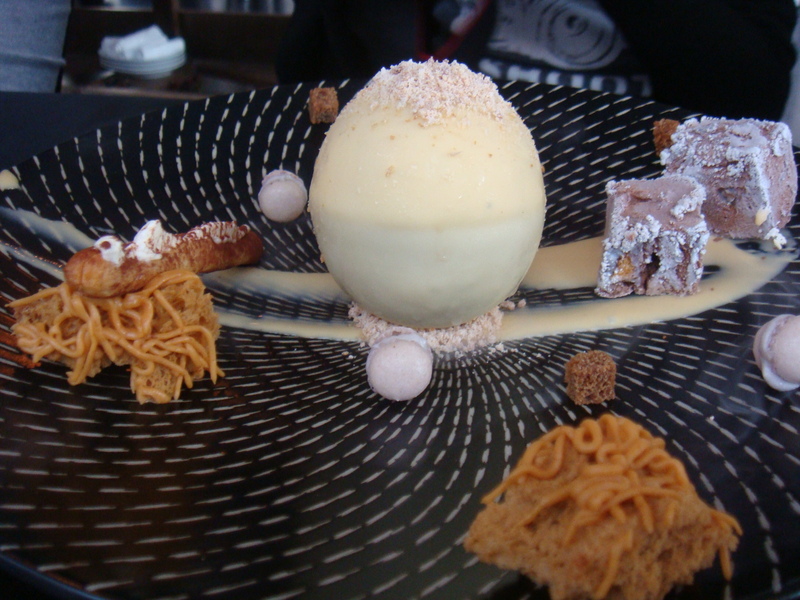 The other popular choice is the chocolate, honeycomb and mandarin sphere, cookies and cream($22). Lots of excited faces around the table when cracking open the sphere to find the creamy chocolate oozing out. I stole a bite of the ‘honeycomb’ that actually tasted like weetbix to me. I was happy to stay with the rhubarb. 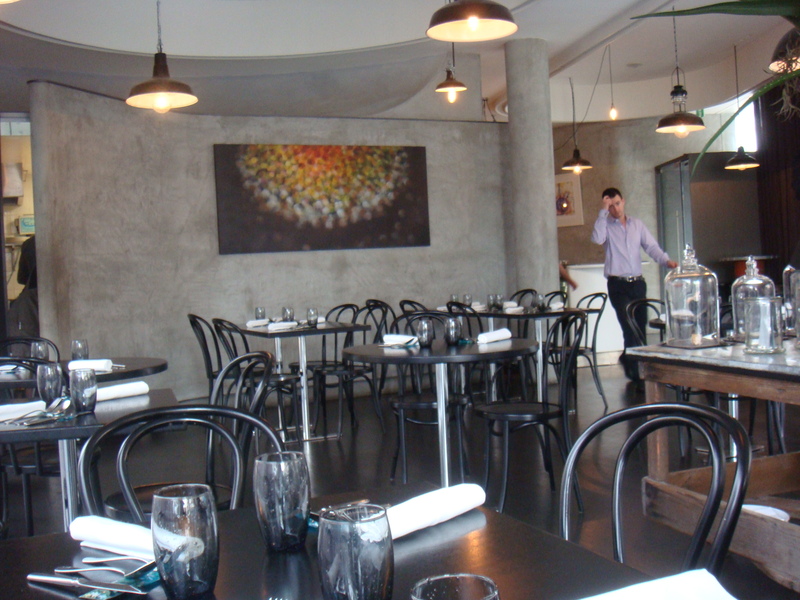 There is a balance between the basic simple-lined interior and the thought provoking, extroverted food. It makes it a comfortable space to enjoy the experience without the starchy clean lines often associated with this style of food. 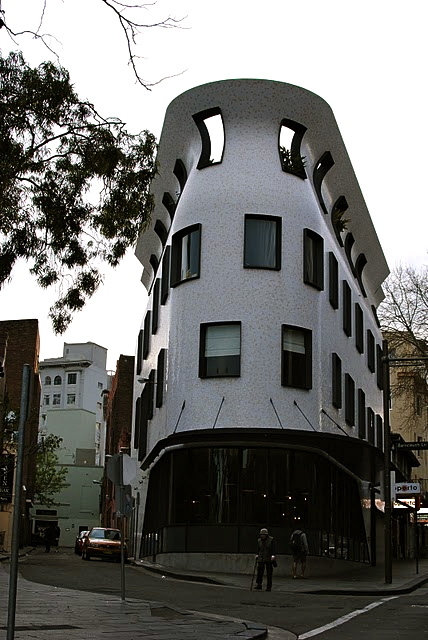 The crazy Gaudi-esque exterior is the perfect exterior to house the surprises inside. I’m relearning Sydney. Every weekend I have spare I spend exploring Sydney suburbs finding out the best picnic spots, the best bakeries,the best Italian, Polish and Spanish delis, the best local restaurants etc etc. Sometimes the easiest and best way to do this is if an expert Sydneysider just shows you. So that’s what I did. 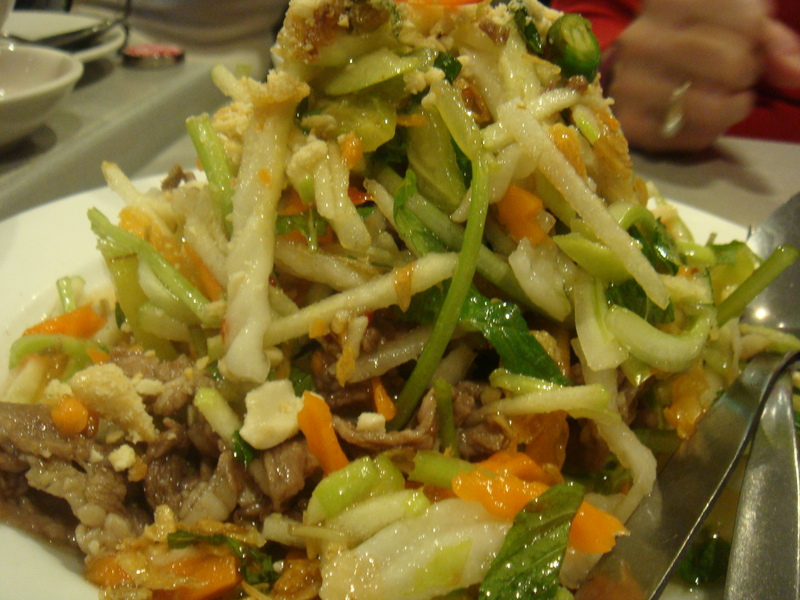 I booked myself on one of Jennifer Lams’ “I ate my way through” tours. I feel so behind my other Aussie food enthusiasts who have been dining on dumplings, Pho, and Ramen for years. Never the less now is the time for me to catch up. 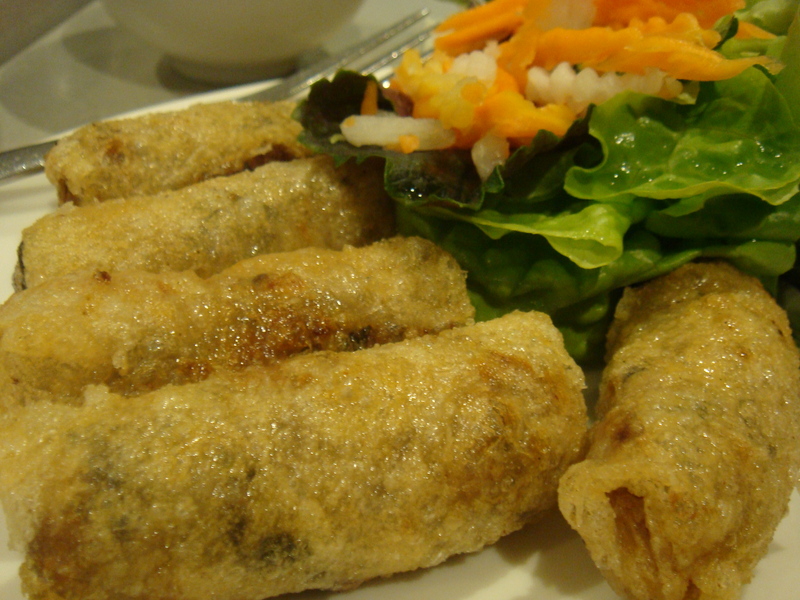 The first and more elusive cuisines I’m keen to learn is Vietnamese. After indulging my panache for all things French whilest living in London I knew it was time to take advantage of the large Asian community living in Sydney. Our tour was very relaxed, meeting at lunch time in Cabramatta. I was early but I resisted the temptation to start buying food. Our group was small, 5 in all, which is always an advantage if you want to ask alot of questions and hear what is said. The tour is run by Jennifer Lam and Betty. In the summer period the groups can grow to up to 12 people. We were all presented with a lovely hessian “I ate my way through” bag, which contained a copy of Jennifers’ book about her trip through Vietnam, some notes about the tour and a few recipes so we could get started straight away. Our tour began by walking around the shops in Cabramatta. 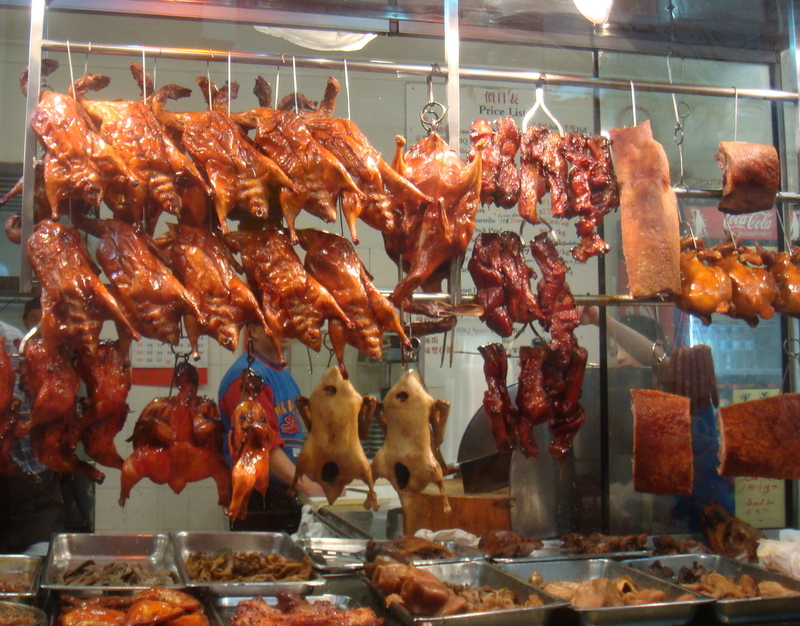 There are alot of arcades filled with grocers, butchers, seafood shops, and bakeries. 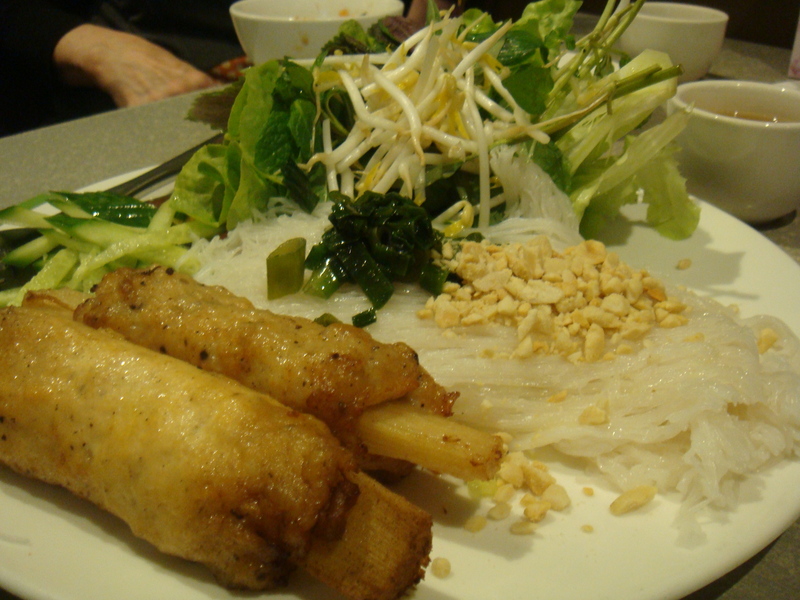 Jen and Betty pointed out a few typical Vietnamese ingredients and welcomed my strange questions. 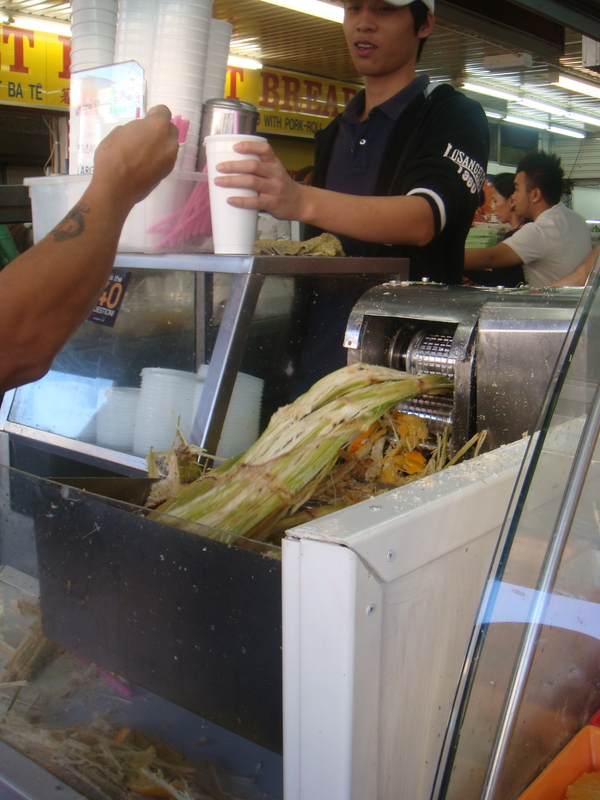 We also tried some very refreshing sugar cane juice. By this stage I was feeling comfortable, knowing my way around and where to get a good banh mi, crispy duck, those pandan waffles and the best Pho. You can imagine how hungry I was by now. The streets were lined with shops selling takeaway and the ‘Aunties’ who illegally sell their homemade goods on tiny crates in front of shops. 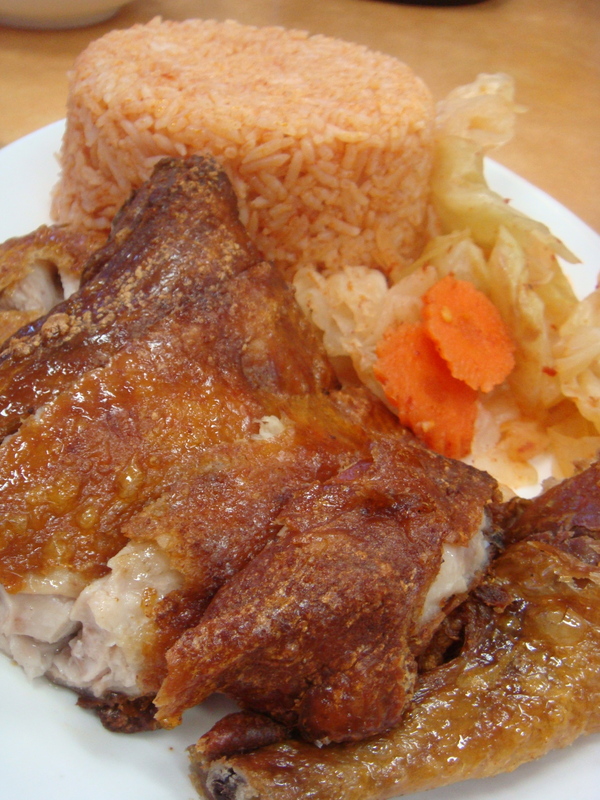 Luckily we were headed to the restaurant well know for their crispy chicken, Tan Viet. The process is started the day before where the chicken is poached then the skin is dried and rubbed with spices before being fried the next day. 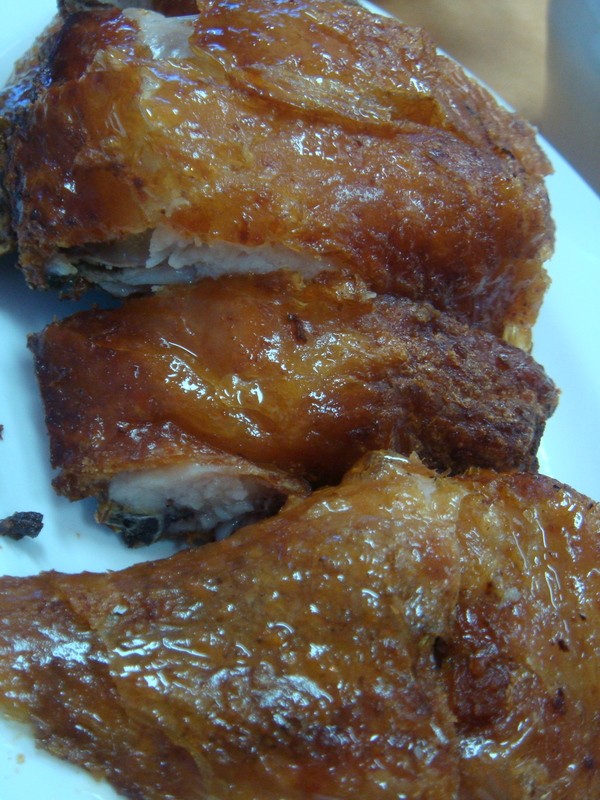 The result is moist chicken and super crispy flavour filled skin. The place was packed with a queue out the door. Jen had lined up a table for us with the manager earlier so thankfully we didn’t have to do the line. It was just enough to wet the palate as we moved onto the next feast. 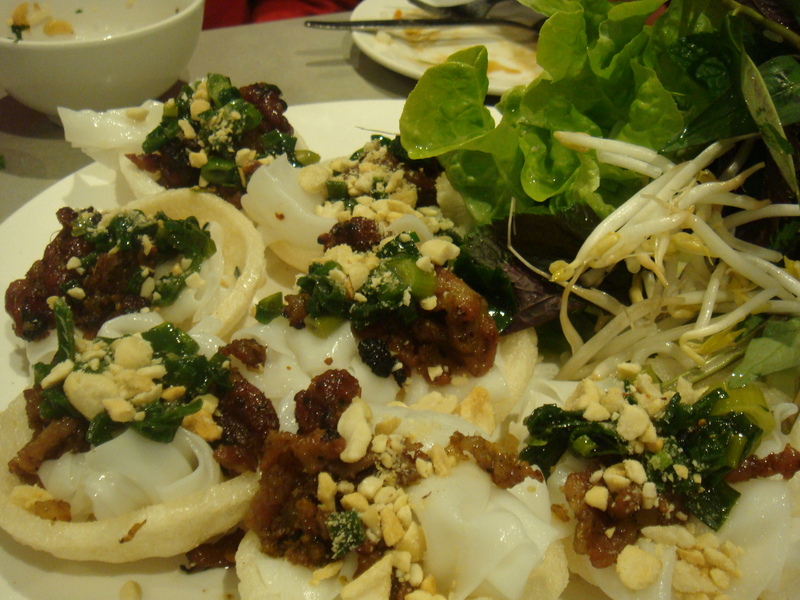 Guan au Bau Truong has the largest menu in Cabramatta, about 180 dishes on the menu. At any ordinary restaurant you would imagine the chaos this would cause in the kitchen and the produce that would be sitting around waiting to be ordered. The food that arrived at our table proved that’s certainly not the case here. The food was all very fresh and from what I could spy at other tables it was true everywhere. This place is definitely on the ‘come back to’ list. The service was fairly swift and dirty plates were quickly swapped with fresh ones as more dishes arrived. It was very reasonably priced too, actually it was cheap. We all left well fed for $10 each (not including drinks)! The tour finished with a chance to do some shopping whilst having the expertise of Jen and Betty on hand. We did some grocery shopping and then a spot of fresh food shopping. If your going to stock up on your asian ingredients I highly recommend you make a trip to Cabramatta. The prices for spices and fresh ingredients are very cheap here, definitely making the trip a worthwhile one. I’m sure you will be inspired while your walking the streets too. The total cost of the tour was $57.62 (including on-line booking fee but not including food) and ran for about 3 hours. At the moment the weekends are mostly mine, trips to the markets, cafes and restaurants to visit, countryside to see….I have alot of catching up to do. Bird Cow Fish has a very relaxed bistro feel with dark timber tables, lighter timber floors, food art and French posters adorning the walls. Their food philosophy centres around seasonal and sustainable produce. Not having a booking they found me a table just near the door but I managed to spot a couple leave and the staff kindly swapped my table. I had already decided to have fish for my main. The waiter suggested I order a side or an entree if I was hungry as the dish was not very substantial. Yes I was hungry, but as usual famished for a feast but quickly filled to bursting. In the spirit of making summer last as long as possible I went with the waiters suggestion of a dry crisp 2008 Even Keel riesling from Clare Valley ($12). Don’t worry you do get more in your glass, I just had a few sips before I thought about getting the camera out. 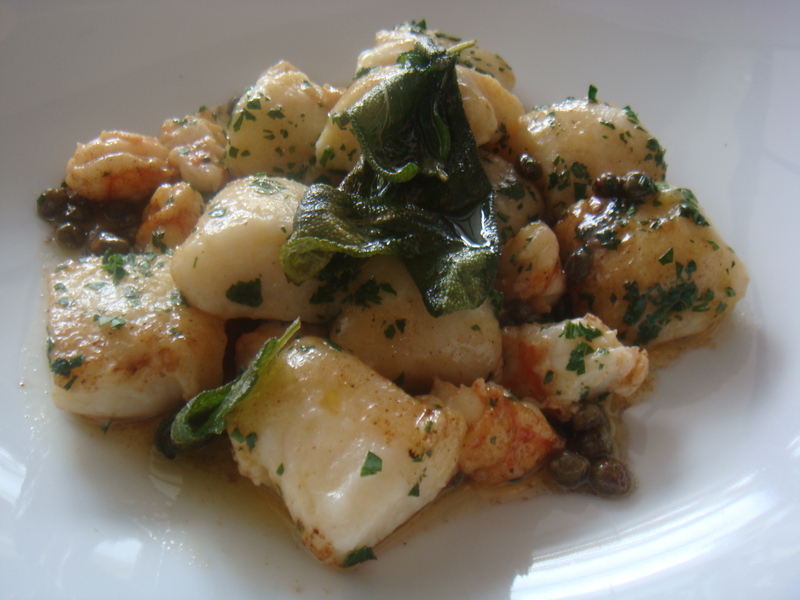 I had my eye on the gnocchi with prawn meat sauteed in burnt butter, verjuice, capers and sage ($19.50). The waiter agreed as he tells me it was one of their signature dishes that chef, Alex Herbert, had demonstrated on Masterchef. Sounded good to me. It was the best gnocchi I have ever had. I started to make hmm noises, in my mind I was rolling my eyes too, I hope no one saw. Alex adds a little parmesan to her gnocchi which adds a slight salty cheese flavour. I haven’t had much experience with verjuice, it’s not widely used in the UK. I knew there was something in the mix, not just olive oil but I couldn’t pick it until I read the menu again. It added a lovely light citrus acidity to the dish. 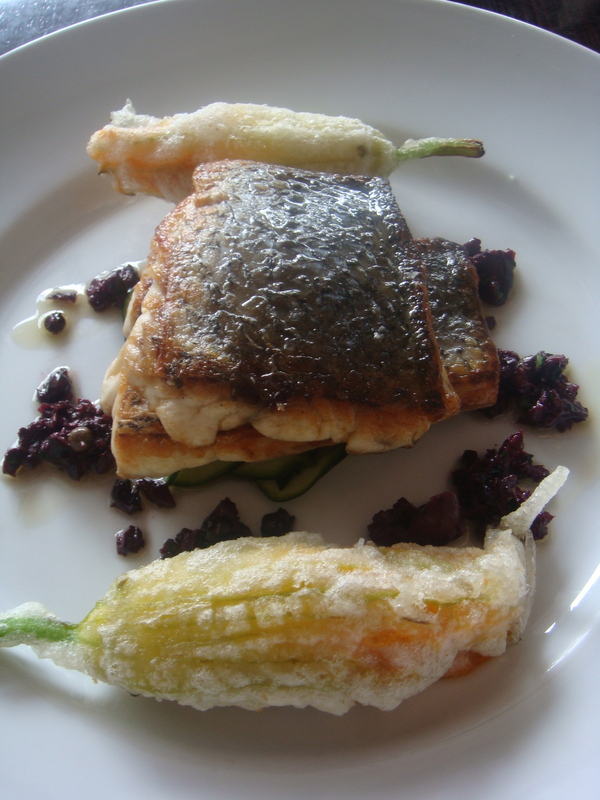 Palmers Island Mulloway Fillet with carpaccio of zucchini, olive tapenade and skordhalia filled fried zucchini flowers ($35.50). Was actually quite a sizable serving with two fillets upon which to work my way through. The crispy skinned fish was full of juice, and look at those zucchini flowers, the batter is so fine you can see the flower through it. If I was really picky a little acidity in the dish, maybe in the zucchini carpaccio, would have made it perfect for me. 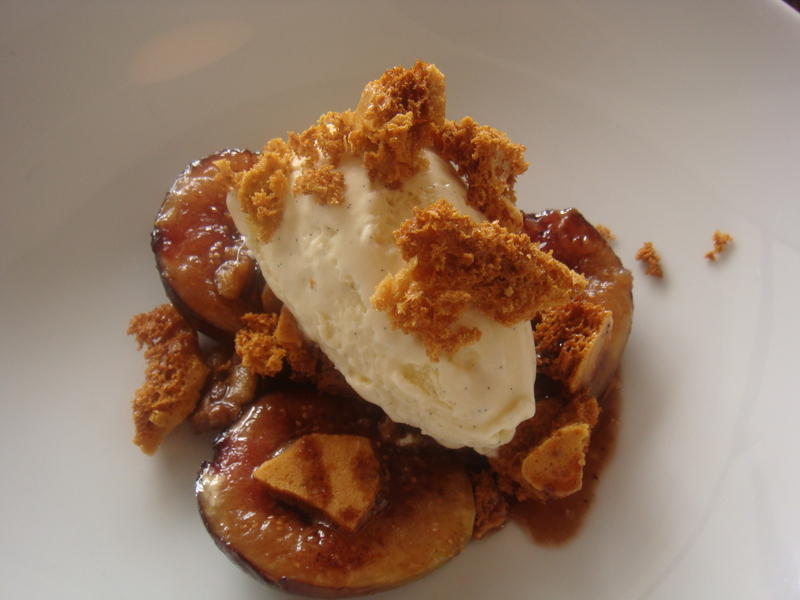 Dessert special was roasted figs with vanilla bean ice cream honeycomb and caramelised walnuts ($15.50). Just looking at the picture you can imagine how good this was.There was still steam coming off the figs and as the vanilla ice cream melted into the caramel sauce, the chewy honeycomb sat sweet with crunch. 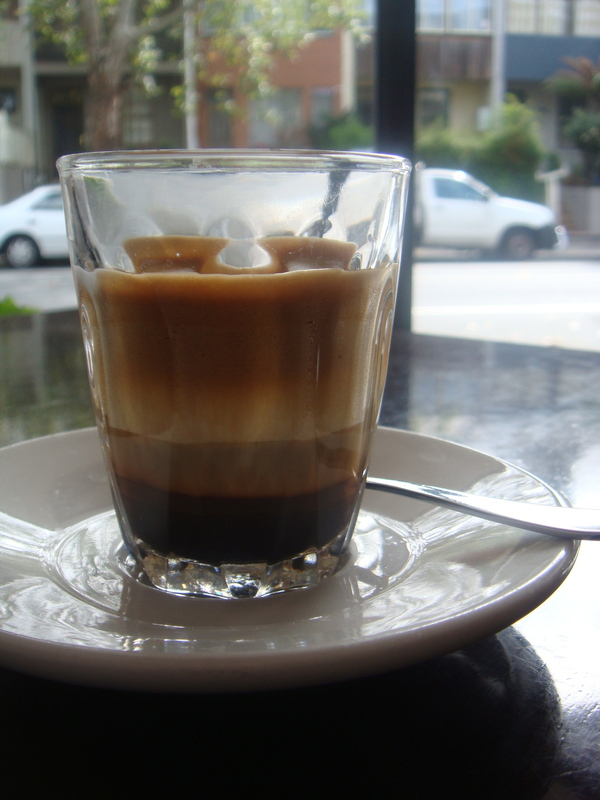 I was still savouring my second mouthful when they brought over my macchiato ($3). Just looking at it I had a little laugh to myself happy in dessert and good coffee land. Fabulous food, lovely friendly, accommodating staff. I left happy. I’ll be back for sure. Yes two days later in fact. Looking for a nice relaxing lunch I headed back. 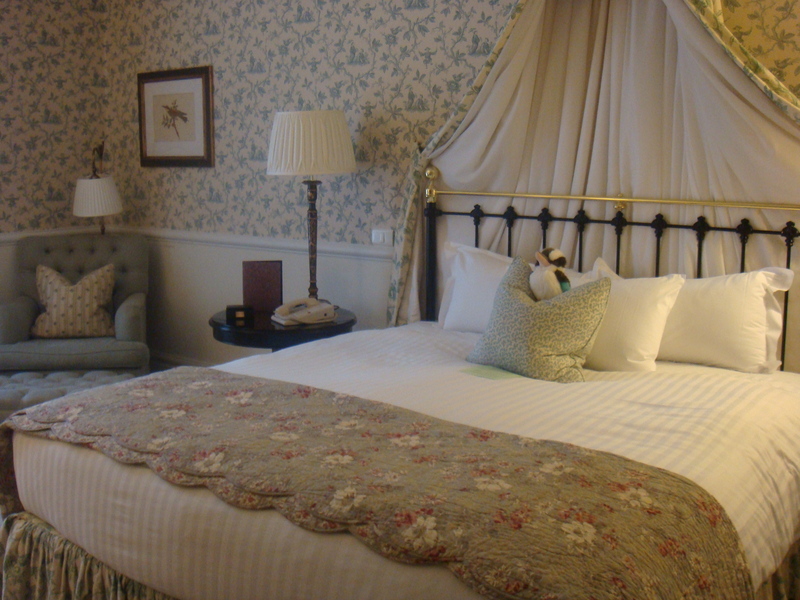 The weekend informalities had been replaced with crisp white linen and folded napkins. I opted for the lunch special of salmon fishcakes, watercress and frisée salad with hass avocado and a tartare sauce ($18.50). 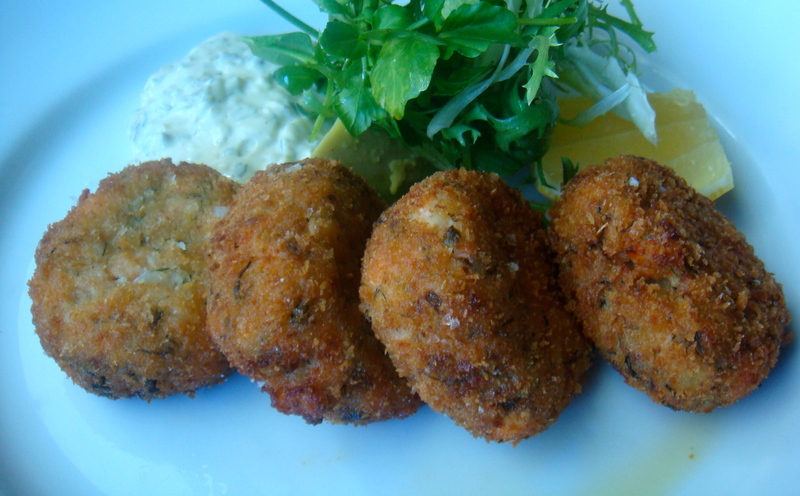 Not overloaded with potato and a touch of dill, the fishcakes were satisfying with a chunky tartare sauce. A glass of dry Crawford River rosé ($11) on the side and some old issues of Gourmet Traveller magazine, made for a midweek lunch for one. And yes, I’ll be back…. Unfortunately Bird Cow Fish closed it’s doors in February 2012. There are often things in your mind that you remember differently to what is actually reality. I’m not sure if that is what happened when on a return trip to Rozelle markets or I have just been spoilt. 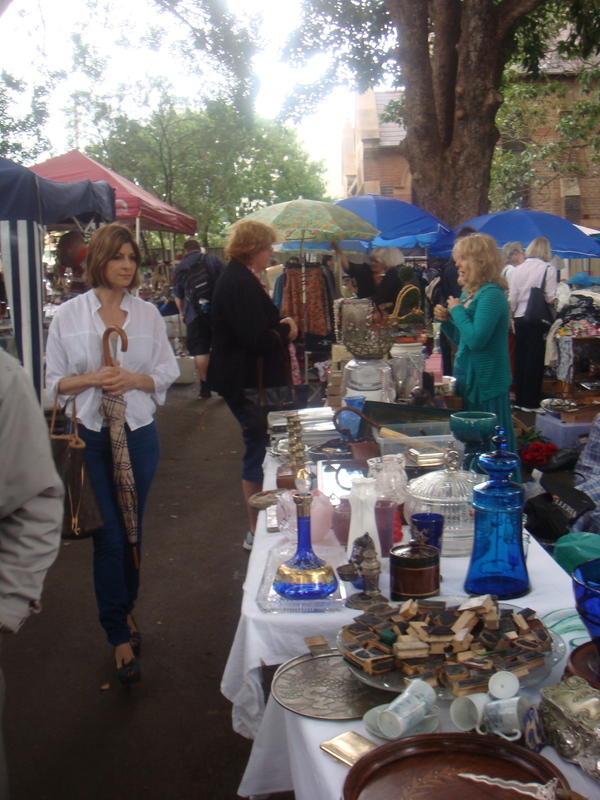 Every Saturday and Sunday the markets are held on the ground of Rozelle Primary School. It has been about 15 years since I was last there so I guess my mind played tricks on me although their website does claim they are Sydney’s favourite second hand market. Really!? Surely not. 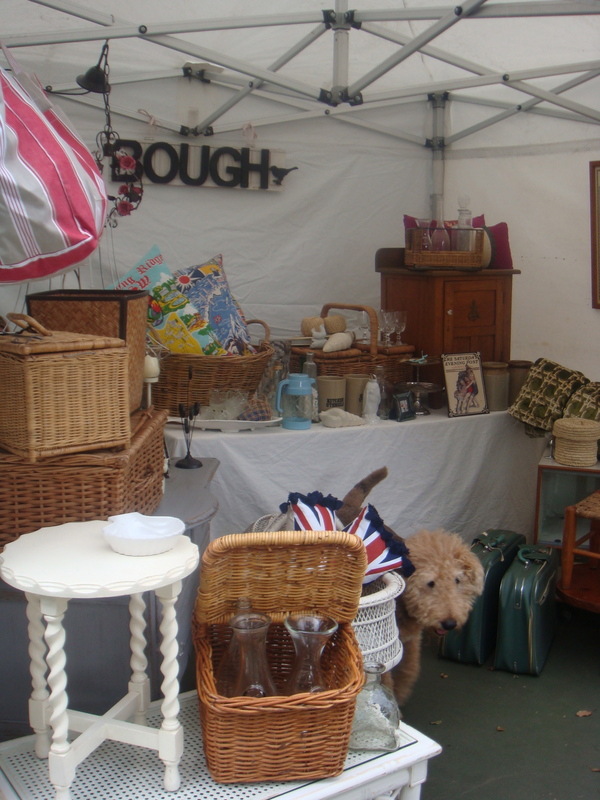 There are alot of second hand clothes, brick-a-brac and plants. If you have a really good look you may find a few odd things but I doubt it will appease the yearning for a good market find. There was one little stand at the back of the school grounds enclosed in it’s own white marque which stood out form the surrounding brick-a-brac. 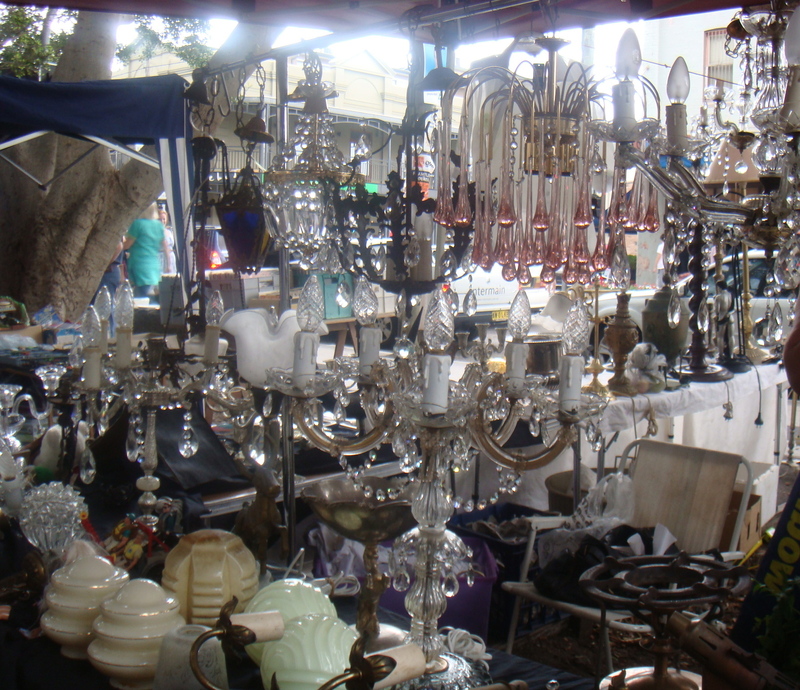 The stallholder had gone to alot of trouble to present her goods in a more appealing way. It did work and I was drawn into her marque away for the impending rain. Although, if you want quality vintage pieces I suggest you save your pennies and head further up the road to quintessential duckeggBLUE. I had already planned to head to love.fish for lunch after reading about it on Katie’s blog but unfortunately it was closed. 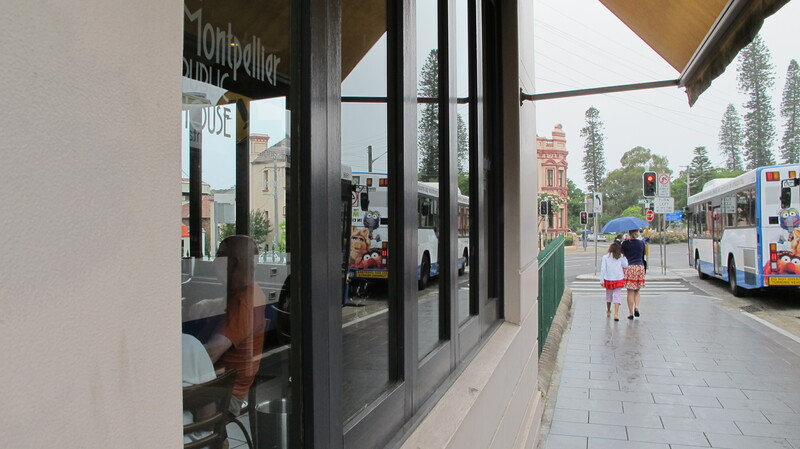 Saturday lunch in Rozelle closed?? Apparently only open 5-930pm daily. Anyway I headed to the nearby Le Grande Bouffe which was busy busy busy. I arrived about 130pm to be told there would be a 45min wait for a table. I was hungry but after pounding the pavement all day I was not prepared to walk back into Balmain to find lunch. The “old man’s pub” on the corner provided a quick drink while I waited. 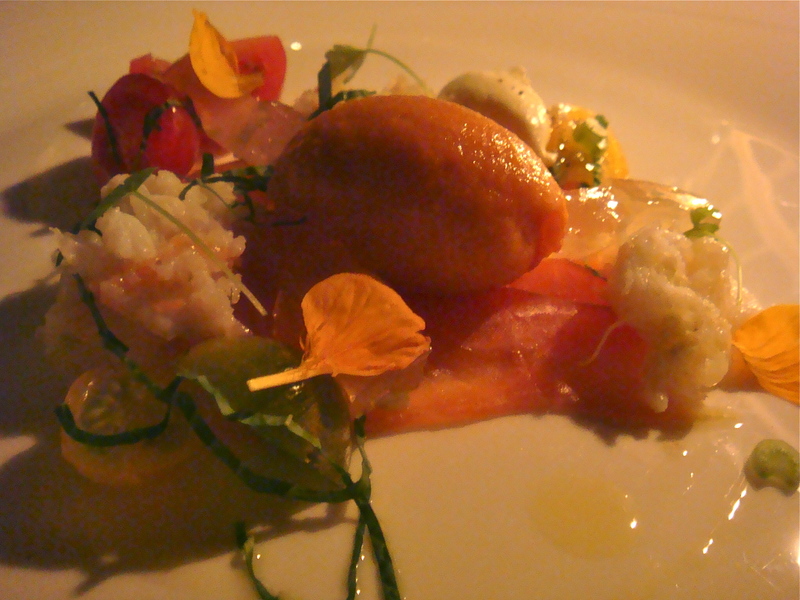 The lightest entree on the menu was a salad of smoked trout, radish, lettuce, and trout roe in a horseradish cream. It was a pleasant first course, crispy crunchy lettuce, very light horseradish and popping trout roe. 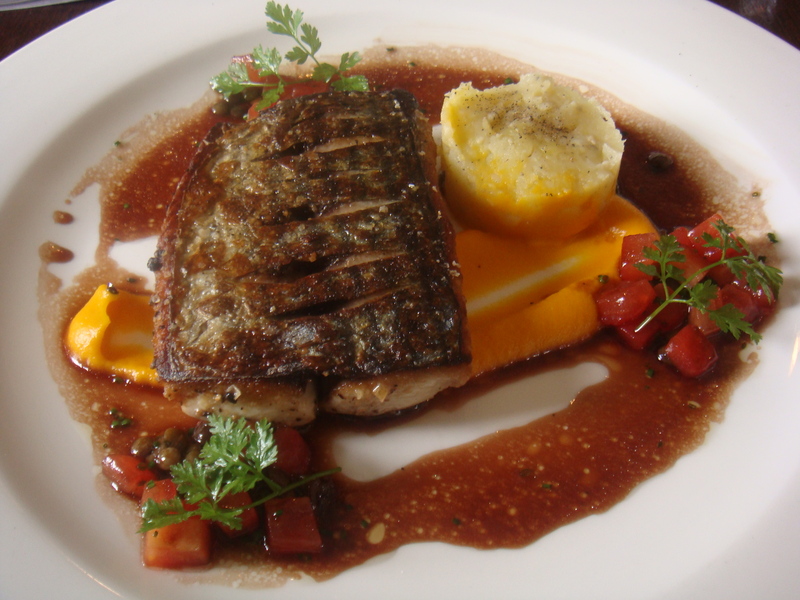 Fish of the day was bonito served with carrot puree, potatoes and a red wine jus. 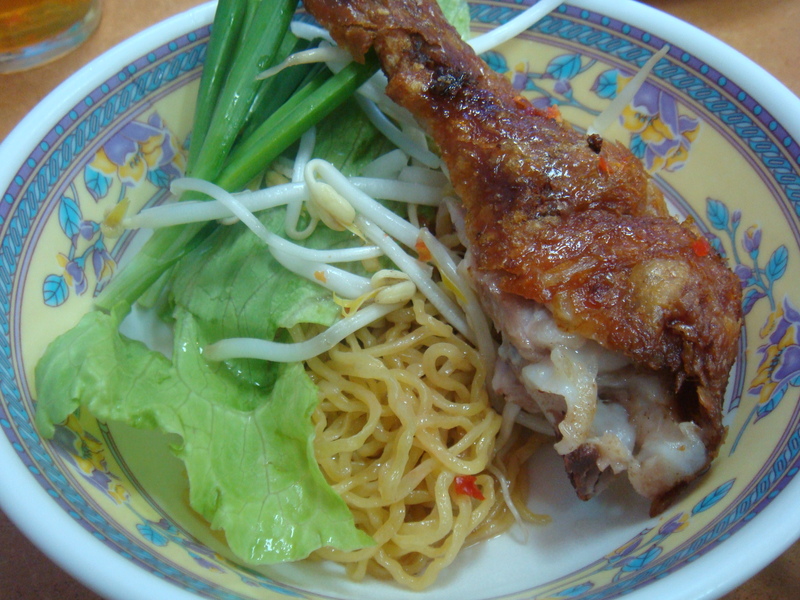 I love crispy fish skin, although the fish itself was over cooked. Combined with the sweet carrot and flavoursome jus it managed bring moisture to the dish. The raw tomato cubes lifted the freshness of the dish. If only the fish wasn’t over cooked I would have loved it. 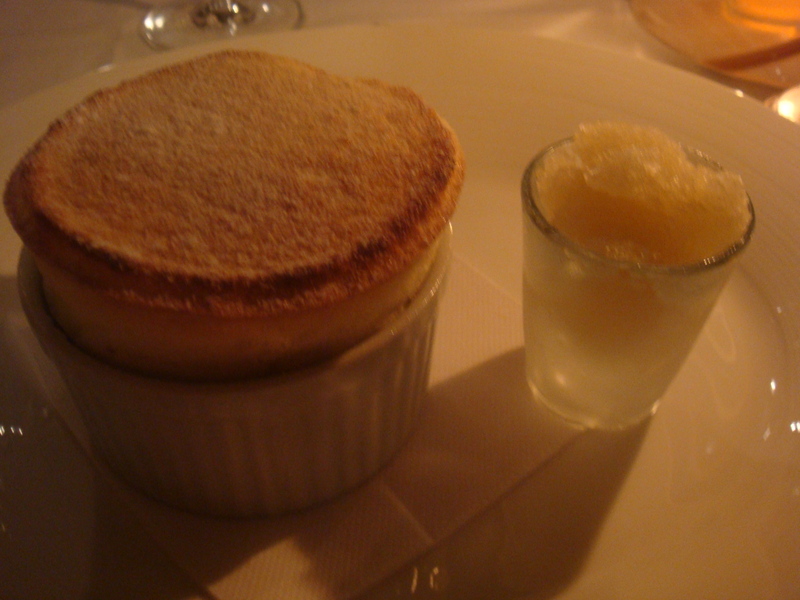 Dessert, sour cherry clafoutis with vanilla ice cream was the highlight. Even the outer edges of what some may say are over cooked, were a flavour filled texture crunch. The vanilla ice cream was very sweet but balanced with the sour cherries a great match. Thin but fluffy, I wanted another. It was a good way to end a meal and I was well looked after by the staff who continued to smile during the lunchtime rush. 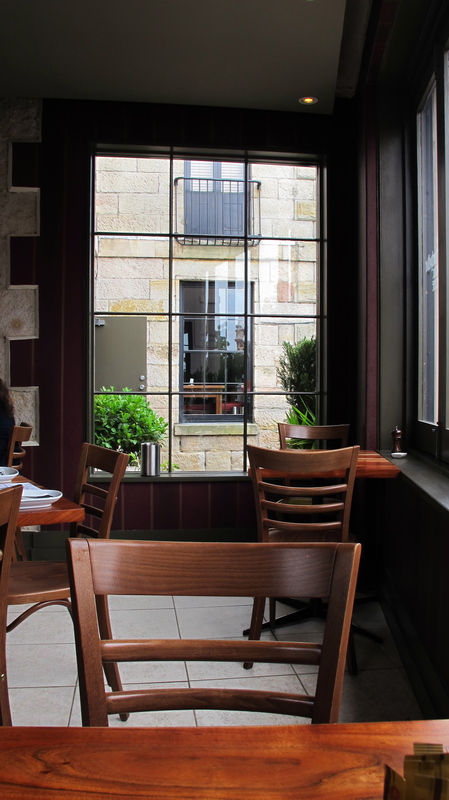 When I’m back in Rozelle I will ring ahead for a table at Le Grande Bouffe. The area was obviously in need of a neighbourhood restaurant of this caliber and has welcomed a bit of french flair amongst the overload of Asian and Italian restaurants which line Darling St. I have read a few blog posts now where people warn against taking photos, or at least asking politely, at certain restaurants and cafes. Even though my blog is still in it’s youth I have been avidly taking photos of food for many years. 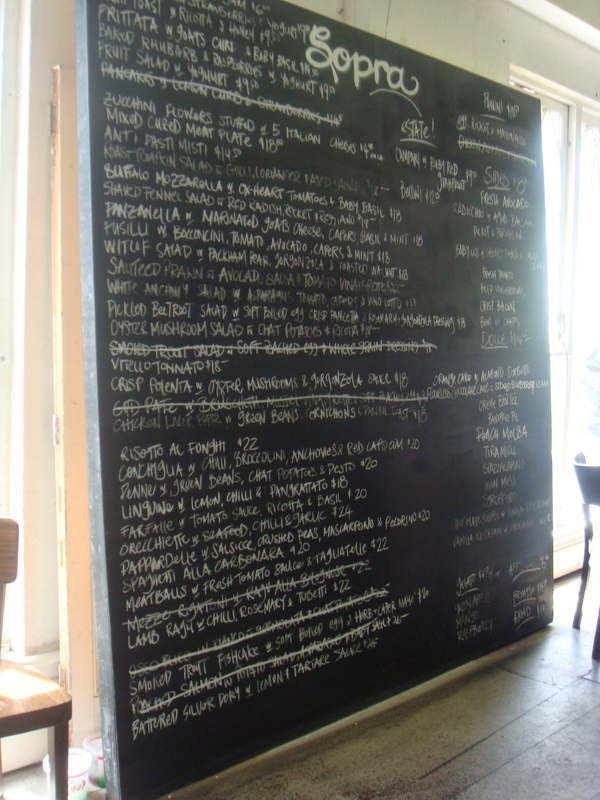 Lunch at Cafe Sopra was the first time I have been asked not to take photos and to be honest I was a bit stunned. It seems to me that if you use your common sense about when it is appropriate or not to get your camera out you shouldn’t get into too much trouble. 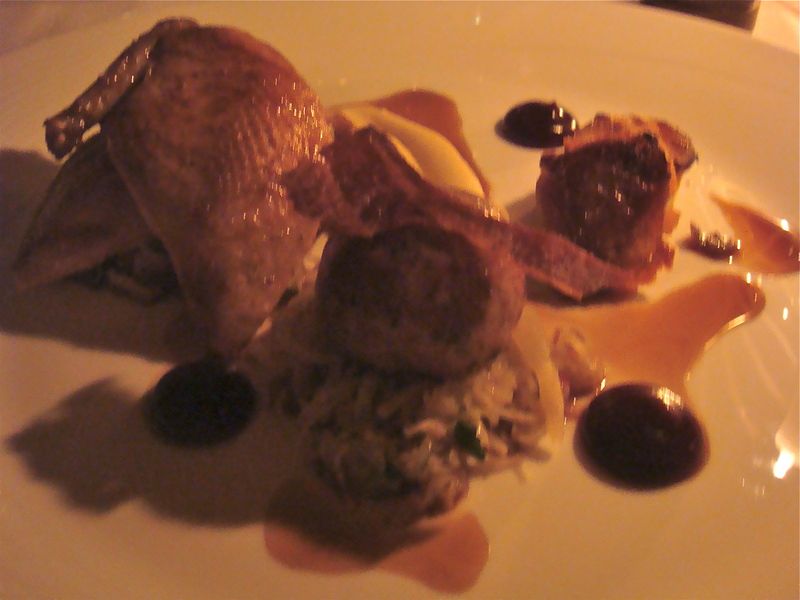 I didn’t take photos at the Waterside Inn or Marcus Wareing at The Berkeley as I didn’t feel it was an appropriate atmosphere for photos but my camera was going crazy at The Fat Duck. I am discrete, I don’t use a flash and only take a tiny point and shoot to restaurants. I thought I had used my common sense at Sopra. 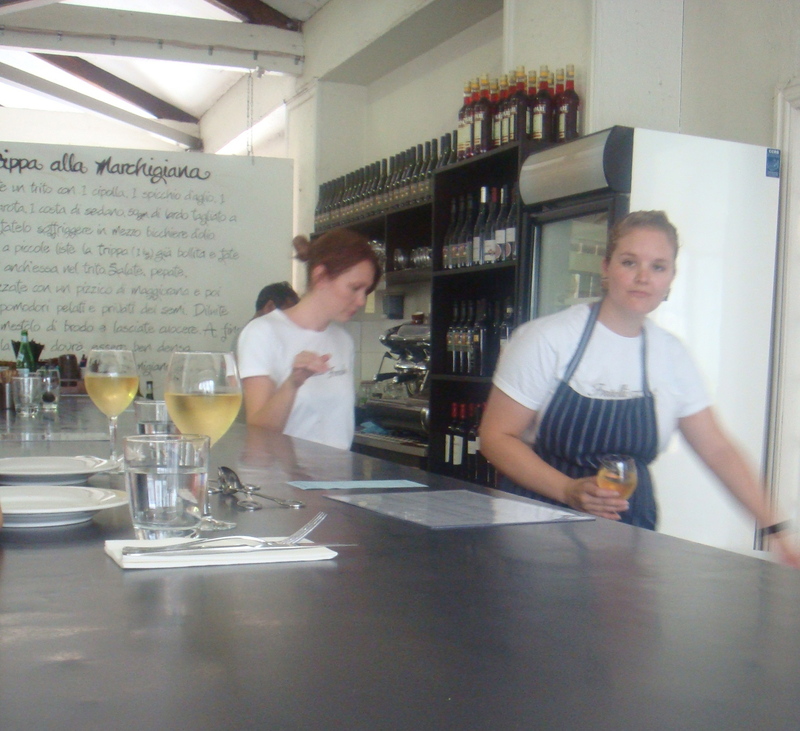 It’s a very relaxed place, in fact it sits above the Fratelli Fresh warehouse in Danks Street, Waterloo. Fratelli Fresh stocks fresh food and produce for commercial use by restaurants. They also open their doors to the public to purchase the same stock as the restaurants, such as Iggy’s bread, smoked trout, olive oil, herbs, imported pasta and cheese etc etc. I managed to briefly snap two pictures before being politely asked not to take photos. Unfortunately they were before the food arrived, so no food shots. It was another steamy day in Sydney, the place was very busy and I sat at the bar very close to the till. 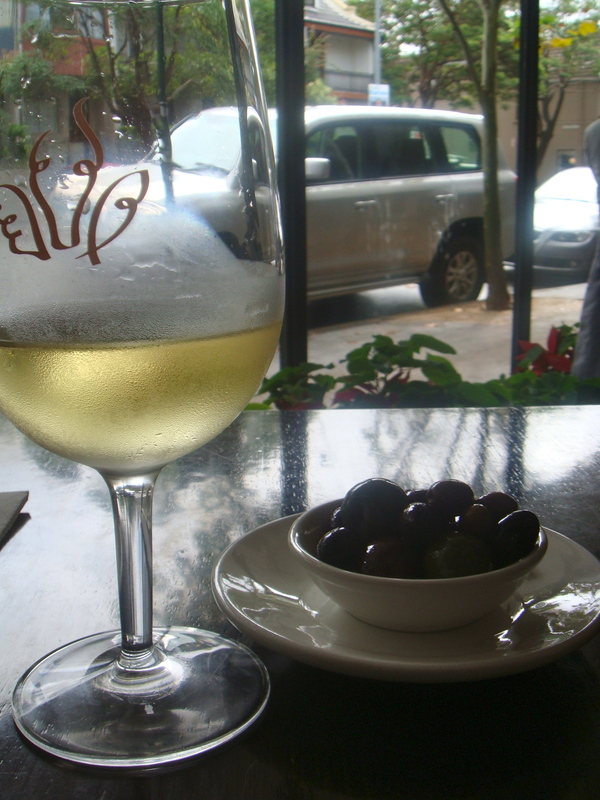 They have some new wines from Italy on their menu and a ’08 Paolo Sordo from Roero Arneise, Piemonte ($9.50 a glass) was recommended to me as a crisp dry wine. Loved it so much I had a second. Sitting so close to the till I heard one of the waitresses come past mentioning to the other that she had to tell someone else not to take photos. So curious to know why, I asked. The waitress said the owner doesn’t want any of his team photographed in a compromising position and that the concept is his original idea and he doesnt want anyone to copy it. Interesting, yes the produce warehouse/cafe is a great idea but hardly ground breaking and it’s open for anyone to walk into, you don’t need a camera to copy ideas. I don’t get it. I think there is more to the story than just stealing concepts. All being said, the staff were very polite and happy even though it was hot and they were woking hard. I could sit then and enjoy my meal thinking it was a bit crazy but knowing I wasn’t the only one told ‘no photos’ today and I wont be the last. The smoked trout fishcake with soft boiled egg and a herb and caper mayonnaise ($20) came out looking like it might not fill me, with one fishcake on the plate but it was huge and the potato mix inside the crispy fried 2 inch thick fishcake definitely did the trick. My eyes being larger than my tummy decided that I must try some dessert too. Orange cake with almond sorbetto. 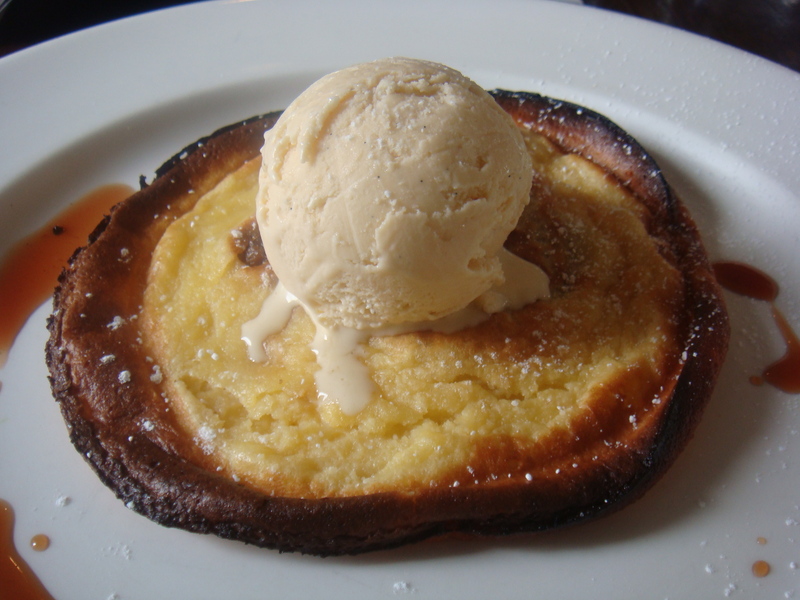 Baked in a flan tin with thinly sliced orange decorating the top with the almond sorbetto melting into it. It was great but I could only manage half, yes too full.